There is durability here as well as security, with 8mm overlap cladding forming the structure of the building. This provides extra protection against rainwater and also plenty of strength too. There is also solid sheet in the floor and the roof for extra toughness against wear and tear. 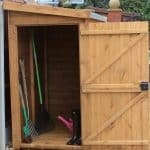 This is a wooden, overlap storage shed which provides a decent amount of space to store gardening essentials. With an apex roof, it not only looks good, but it is naturally protected against the elements. Complete with a heavy duty felt covering, the shed is extremely weather-resistant. Another benefit of the apex design is the increased interior height. Centrally you will find that the shed provides more head space, making it easier to move around. The roof is 1.96m tall, while the eaves are 1.58m tall. Other important measurements to take note of include the width at 1.48m and the depth at 2.13m. The single door also has a wide design, measuring 0.73m wide and 1.96m high. Overlap cladding tends to be the most popular construction for garden sheds. This is largely because it is cheaper and easier to use. It still manages to give the building a strong, durable finish, but it just isn’t as thick or durable as other cladding types. However, at 8mm thick, the overlap cladding on this shed is pretty good. It is important to note that you will need to treat the building in order to boost its longevity. 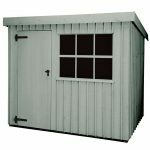 Like other sheds in the Waltons collection, this one comes with double framed corners and an overall framing of 28mm x 28mm. The floor consists of solid sheet board which may not be strong enough to handle larger, heavier items. To solve this problem you would have to spend additional money on an extra strength floor support pack. We recommend you do this anyway for complete peace of mind. Regarding the warranty, we like the fact it comes with a 10 year anti-rot guarantee. However, like any warranty there are terms and conditions attached. The main one is that it will not cover you unless you have applied a spirit based treatment after assembly. You also need to maintain the treatments in accordance with the manufacturer’s instructions. The shed is supplied with a single ledge door. This means you can easily attach a hasp and staple. It also comes equipped with a turn button locking system. While this isn’t the most secure lock available, it does ensure that the doors stay shut and it should prevent small children from accessing the shed. There aren’t any windows so this is great if you’re hoping to keep the contents private. There are plenty of customisation options and extras available for this shed, with some being more advantageous than others. For example, the one thing that may cause the most concern with the base unit is the weakness of the floor. Unlike other large buildings, Waltons don’t supply a free upgrade. Therefore if you want to have reassurance that the floor will securely hold larger, heavier items, you will need to buy the extra strength support pack. This features 2350mm long floor joists that are designed to just slot between the existing joists of the building. It is worth noting that you may need to trim them down a little so that they fit properly. Another durability enhancing upgrade available is the superior duty felt. 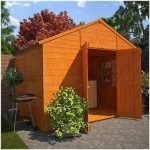 Available in two colours, not only can you enjoy a more water-resistant design, but you can also subtly change the shed’s overall appearance. Not an essential upgrade, but it’s something to think about. The one extra you will want to take advantage of is the weatherproof padlock which comes with a hasp and staple. As mentioned earlier, there isn’t an actual lock on this shed, only a catch, so you will need to buy a lock to make sure your belongings are safe and secure. We like that Waltons have given you the option to add treatments to your purchase. As the shed does need to be treated after construction, investing in one of the high quality preservatives on offer ensures you are ready to treat the building straight away, either before or after you have assembled it. 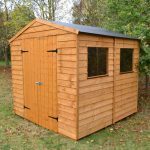 With plenty of attention to detail and a flawless finish, this shed offers excellent quality. The overlap cladding is both durable and reliable. 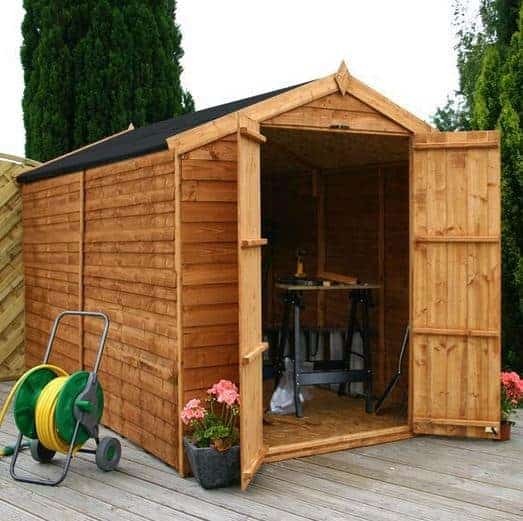 Providing you follow the treatment instructions the shed should last for years before showing any signs of wear and tear. Thanks to the large, wide double doors and apex roof, you are provided with a lot of space, making this an ideal storage or work place. We are pleasantly surprised by how easy the shed is to assemble despite its large size. It is a two person job and it will take at least half a day to build, but the actual assembly itself is easy which is always a big advantage. 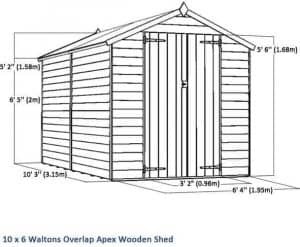 The cost of this large shed is kept to a minimum thanks to the overlap cladding. Whilst still providing a solid construction, it makes the shed much more affordable. We’ve taken into consideration the cost of yearly treatments which is why we couldn’t give it a higher rating. 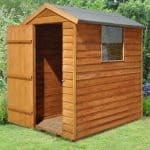 Final Thoughts: Large, durable and private, this is a great shed for those who benefit from a large garden. Recommended for storing machinery and expensive tools, your items will be securely kept out of public view. It doesn’t come with a lock so we do advise investing in the weatherproof padlock. 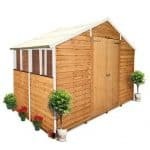 Overall though, it is a good quality, affordable shed that will look great in the garden.